Frank Perls Galleries, Beverly Hills. Mrs. Stephen Clark, New York; sale, Christie's, New York, 17 May 1983, lot 62. Acquired by the family of the present owner, circa 1985. Art News, New York, 13 May 1939. M. Laffaille, Raoul Dufy, Catalogue raisonné de l'oeuvre peint, Geneva, 1976, vol. III, p. 25, no. 952 (illustrated). Pittsburgh, Carnegie Institute, The 1934 International Exhibition of Paintings, October-December 1934, no. 164. Paris, Galerie Max Kaganovitch, Oeuvres récentes de Raoul Dufy, June 1936, no. 21. London, The Lefevre Gallery (Alex. Reid & Lefevre, Ltd.), Raoul Dufy, July 1936, no. 37. Paris, Petit Palais, Exposition Internationale des Arts et Techniques Modernes, May-October 1937. New York, Bignou Gallery, Raoul Dufy, March-April 1938, no. 10. Washington, D.C., The Whyte Galleries, Raoul Dufy, Exhibition of Paintings, Watercolors, Gouaches, and Lithographs, May 1939, no. 12 (illustrated). The present work depicts Nogent-sur-Marne, on the eastern outskirts of Paris. 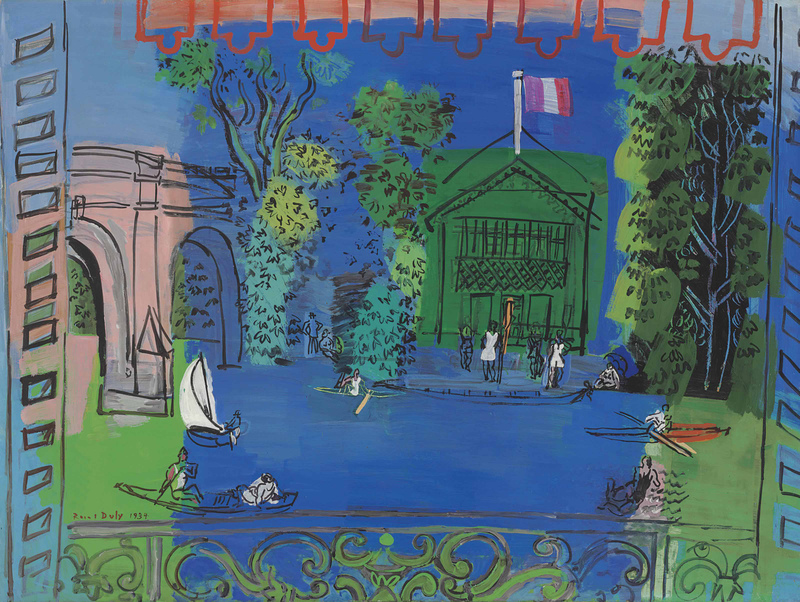 While oarsmen featured in Dufy's work as early as 1919, it was only several years later that he painted them on the Marne, often focusing on the boathouse, as here, with flag flying overhead and viaduct at left. Dufy returned to the scene periodically until the mid-1930s, executing many sketches in pencil and pen and ink, with some 19 completed oils, of which Nogent-sur-marne is one of the last and most satisfying. Dora Perez-Tibi writes of these works: "What [Dufy] is seeking to capture is man at work, surrounded by light. Dufy distributes this light over the surface of the canvas according to a three-colour principle which allows him to modulate it by ridding himself of shadow. Refusing to divide each object into light and shade, he illuminates the vertical objects facing the source of light, arranging them vertically in relation to the light. Thus, he juxtaposes, vertically or horizontally, three zones of contrasting colours" (Dufy, New York, 1989, p. 139). Nogent-sur-Marne differs from the run of the series in its scale, being among the largest, and its unusual perspective. Whereas the rest are straightforward views of oarsmen, the boathouse or the river itself from the opposite bank, in the present painting, we view the whole from an elegant balcony, flanked by open shutters, over baroque railing, underneath the bright red awning. Only one other oil situates its perspective in this way, the smaller and later variant, Le balcon sur La Marne (Laffaille, no. 953). With its striking composition and orientation, Nogent-sur-Marne was highly regarded on its completion, featuring in international exhibitions at the Carnegie Institute in Pittsburgh the year it was painted and at the Petit Palais in Paris in 1937.